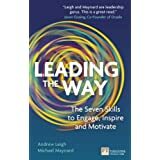 Leading the Way, The Seven Skills to Engage, Inspire and Motivate by Andrew Leigh and Michael Maynard is a truly brilliant, modern, fresh thinking read for any Leader wishing to unlock and enhance their leadership potential and impact. Leading the Way is a real page turner, a compelling read with something to learn and take away on every page. This book is highly recommended for the Leader that wishes to develop their skills set further with up to date, practical tools and techniques.